When searching for used forklifts, you can call to speak with one of our dealers or do a bit of window-shopping to save time. You can scroll over the forklift trucks image to learn more about each type. Then, click on the forklift image and narrow your search by location and instantly view all used forklifts in the location closest to you. You have the option to contact the dealer directly or have the dealer call you back. Our dealers are available to answer all your questions as it pertains to the purchase of used forklifts. We offer service contracts on all purchases and delivery is available in all 50 states and 13 Canadian provinces. There are many things to consider when deciding to forklift more than a few hours every day for heavy lifting, a new although more affordable, are better suited to handle less frequent use have greater capabilities and dealers generally offer warranties with which is why most companies purchase used forklifts versus new type and the engine type you need for your application. 123Forklift has Thousands of used forklifts in stock in over 75 locations across North America making it the largest network of forklift dealers in the U.S and Canada. We carry new and used forklifts in every major make and model. Our dealers carry all major brands of forklifts to include Yale, Hyster, Crown, TCM, Raymond, Daewoo, CAT, Nissan, Mitsubishi, Clark, Toyota, Linde and Barrett. We specialize in new and used warehouse forklifts to include narrow aisle reach trucks, pneumatic tire and cushion tire forklifts, order pickers and electric and manual pallet jacks. Some of our forklift dealers carry rough terrain forklifts, telehandlers and scissor lifts. 123Forklift makes it easy to compare forklift prices, service plans and warranties on all used forklifts. You can scroll over the forklifts image to learn more about each type. Then, select the type of forklift you need, narrow your search to the location closest to you and instantly view the forklift inventory at that location. If you prefer to speak with a sales representative call (877) 327-7260 Monday – Saturday from 9AM to 5PM. Shopping for forklift trucks can be time consuming. 123Forklift makes it easy to find the right used forklifts. Let our sales representatives know exactly what the application is and we will help you determine what type of forklifts are best. If you are a dealer, simply search by type and call to get dealer pricing. 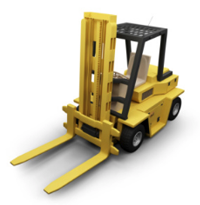 Each forklift type serves a very specific purpose and has unique characteristics that users require. If you are new to buying a forklift, carefully consider what type of forklift you need. What will the forklifts be used for? How much weight will you be lifting at one time? How high does the forklift need to reach? Will the forklift be driven indoors, outdoors or both? Is fuel type important to you? Forklifts run on diesel, liquid propane and electric. Electric forklifts run on a battery and or more expensive than their IC counterparts upfront, but are much less expensive long-term (no fuel costs). Click on the links below to learn more about the different forklift types, or scroll over the forklifts image above. The two main types of forklift engine types are electric forklifts, powered by a battery, and internal combustion (IC) forklifts, which have a traditional engine that runs on liquid propane, gas or diesel. From a pricing standpoint, electric forklifts are more expensive than their IC counterparts upfront, but pay themselves back over time. Electric forklifts are suited for indoor use and have several advantages. They are eco-friendly in that they emit no harmful pollutants into the atmosphere. Since electric forklifts use a battery, there are no fuel costs; they operate a great deal more quietly than internal combustion engines and last longer than internal combustion engines because they have less moving parts. It is important to note; however, that electric forklifts have a limited run cycle, usually 4 – 6 hours and are less capable of lifting loads greater than 15,000 pounds. In addition, you will need to purchase a battery charger and keep it in a well-ventilated room. It is recommended that you purchase and extra battery so that the forklift can be used continually without having to cool it and re-charge every six hours. Internal combustion (IC) forklifts can handle heavy loads and better apt to work on uneven pavement like gravel outdoors and are capable of lifting heavy objects greater than 15,000 pounds. The cost for a typical IC forklift is also much less than its electric counterpart upfront, but costs more over time due to fuel costs. IC engines run on gasoline, diesel fuel, or liquid propane gas (LPG). Since burning these fuels produces emissions, the environment is impacted to a certain degree. These types of forklifts are faster and much more powerful than electric forklifts, but are also much louder. The type of tires you choose for your forklift greatly depends on the type of forklift you purchase and the driving environment. Cushion tires made of solid rubber and are generally used indoors on level surfaces. It is common for indoor electric forklifts to use cushion tires. These tires appear to have a flat surface with no ridges and work best for internal applications. Pneumatic tires are inflated rubber and are more expensive than cushion tires. IC forklifts will generally use pneumatic tires for heavy lifting and lifting on uneven surfaces. Solid pneumatic tires are not filled with air, but do have the ridged texture of the typical pneumatic tire making them a perfect solution for rough terrain applications.